Compact design allows you to reach areas larger tools can't reach. Provides a perfect finish every time. 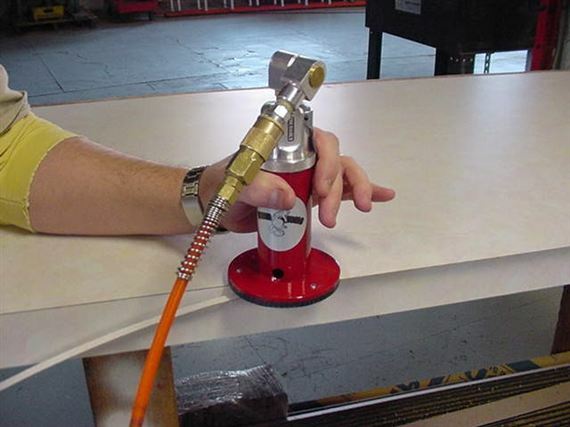 Safety latch prevents the tool from turning on when tipped on its side. Weighing in at 2.2 pounds, the AT1 Air Router packs heavyweight performance on detail routing work into its lightweight size. The compact design makes the Air Router ideal for chamfers and round over cuts on hardwood, softwood or solid surfaces. This tool will save you money by avoiding the cost of replacing short-life switches and brushes and it will not overheat. Your productivity will increase with the Air Router's lightweight design that reduces user fatigue.